Software for the E400 can be downloaded here. See the comprehensive review of the E-400 by John Foster on his website. This includes a large number of tests and test images. The cameralabs.com review is interesting and contains a side-by-side comparison to the Canon 400D and the Panasonic L1. TrustedReviews have an interesting review. digicamreview have a review of the Olympus E400, with many photos of the camera with different accessories, test images showing the performance at different ISO levels, test results and high resolution sample images. Photographyblog have a comprehensive, six page review of the Olympus E-400, with sample images and high resolution originals. ephotozine have a short, but interesting review with some sample images showing different ISO settings (and a comparison with the Sony Alpha and Canon 5D). Andrzej Wrotniak has a short, but interesting review of the Olympus E400 on his site and the only and full resolution samplesI have found so far. Snaarman upgraded from the Olympus 8080 to the E400 and posted an interesting comparison here. PCW (a computer magazine) have a review of the E-400. digitalkamera.de have a brief article in German with some pictures of the camera about the E400. Photographyblog have a page with 25 high resolution samples of the Olympus E400. Andrzej Wrotniak has some high resolution originals on his site. Camerlabs have some samples and 100% crops. No high resolution originals however. See the samples and 100% crops of TrustedReviews.com. No high resolution originals available. Here is a comparison between the E400 and the Olympus 8080. Olympus has released a codec for Windows Vista. The codec is a piece of software running under Windows Vista with which Vista can import and display RAW images of all Olympus DSLRs. Adobe Photoshop CS2 is capable of converting E400 RAW files. You will need the Camera RAW 3.6 plugin. But you can also buy the cheaper Adobe Elements 3, which also supports the plugin. Another good RAW converter is Olympus Studio. dcraw by Dave Coffin is an open source software used by several RAW converters, which can convert E400 RAW files. It's available as source code, command line executable or within a large number of image editing softwares. See Dave Coffin's page for an exhaustive list. Even Irfanview can decode E400 RAW files, thanks to the dcraw code. The E400 takes both CF and xD cards. There is no reason to use xD cards (unless you want to use the inbuilt panorama function), since CF cards are cheaper. The [PICTURE MODE] can be changed when the shooting mode is set to [AUTO]. [PICTURE MODE] default setting is changed to [@NATURAL]. To remove chromatic aberrations you can process the RAW image with the Adobe Photohop RAW plugin. It is very simple to remove chromatic aberrations from an image. Simply use a photo editor and set the saturation level of magenta (also green where this makes sense) to the minimum. In some images you might have to set the saturation level of red to the minimum. It might also make sense to limit the processing to the affected area (i.e. select the affected image area and only process that). The ME-1 eyecup magnifier enlarges the view by 20%. The eyecup incorporates two lenses and measures 40 x 30 x 12mm. The FP-1 Power Flash grip is designed for use with the FL-50 high-voltage pack and can be used in combination with the flash unit's built-in power supply to provide fast flash charging for an extended number of shots. The head is can be rotated by 180� for increased versatility. 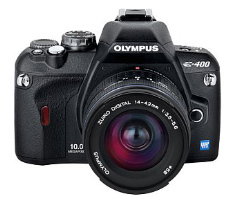 Olympus E400 system chart: lists all accessories of the E400. The site Infrared photography with your digital camera contains interesting information about infrared photography with Olympus cameras and an overview of infrared filters with their spectral characteristics. Echeng.com: Digital infrared photography - site devoted to digital infrared photography with image galleries, information about filters and equipment and links. Wrotniak's Infrared Photography page - excellent information resource devoted to infrared photography with Olympus cameras. Information about infrared filters, exposure settings, focus, post-processing, sample images and links. Also see the Infrared photography page of the Apogee magazine: this is an interesting general introduction to infrared photography with digital cameras. Photozone.de have detailed and accurate reviews of four thirds lenses. Firmware updates for Olympus Four Thirds and the Leica D Summilux lenses are available on this page. How good are the kit lenses? John Foster has done an interesting review comparing the Zuiko 14-42, 14-45 and 14-54 lenses. The review was done with the 10MP Olympus E400 DSLR and shows better results with the pro Zuiko 14-54 lens. Here are two tests of the Zuiko Digital 7-14 mm F4 lens, one performed by Andrzej Wrotniak and one by John Foster. The one by Andrzej Wrotniak is a bit more scientific, with physics formulas and resolution charts, while the one of John Foster is more from a user perspective and contains many sample images. The Olympus E400 has a standard flash hotshoe and can take standard external flashes (among others the FL-20, FL-36 and FL-50). Try out the Metz flash units - cheap and reliable. Alternatively try the FL-36 or other Olympus flash units. See here for how to measure the trigger voltage of your flash. You can use Olympus Studio 1.5 to control the Olympus E400 with a computer. Olympus is offering the PT-E03 underwater housing for the E400. Policarbonate, waterproof up to 40m, takes the FL-36 TTLflash with the PFL-01 & PFL-E01 flash housing. Five interchangeable lens ports allow the optional use of the Olympus 14-45mm, 14-42mm, 11-22mm or 14-54mm, 7-14mm, 8mm Fisheye and the 35mm as well as the 50mm Macro lens. Olympus also offer the PPO-E05 lens port (i.e. an underwater housing) for the standard 14-42 Zuiko lens. The site Digideep.com is an online directory for digital underwater photography. Jpegdump, by Kurt Stege, is a free tool to recover deleted images from a memory card. Recommended, alough it involves more work an e tool of Convar. Christian Grau has some software tools to fix damaged memory cards. The software used to be free, now costs $39. Datarescue also has a software tool (Photorescue) for repairing damaged memory cards, although it's not free. Photorecovery is another tool. Price is $39.95. In addition to the E400's inbuilt noise reduction, you can post-process the images with NeatImage. This software package produces surprisingly good results. Here there is a comparison of different noise reduction software tools. The picture files of the Olympus E400 contain the complete exposure information (aperture, exposure time, focal leng, white balance etc.). ExifReader, by Ryuuji Yoshimoto. Haven't tried the software myself, but it looks interesting. Freeware. "EXIF viewer is a simple image viewer application for photos taken with digital cameras. It's capable of reading EXIF information embedded in photos as well as little thumbnail. Because small thumbnail is already present in most photos displaying it is really fast. EXIF viewer can also provide detailed information about photos (shutter speed, aperture, etc.) and conveniently list them for comparison purposes. EXIF viewer also displays image histogram. It also features copying/moving and deleting of selected photos. Single photograph can be displayed in separate window or in a full screen mode." "Exifer is a nearly free software (you only should send me a postcard if you're using Exifer frequently) with which you can manage the metadata (EXIF/IPTC) of pictures taken by digital cameras. Because many image processing software destroys this metadata when saving such files, the idea was to create a backup of the metadata before editing it in any software, and then, after that to restore it back into the processed file. With Exifer you can do this very easily. " This may be also a good source. And last but not least this site has enough links and information to keep you plugged for several lifetimes.